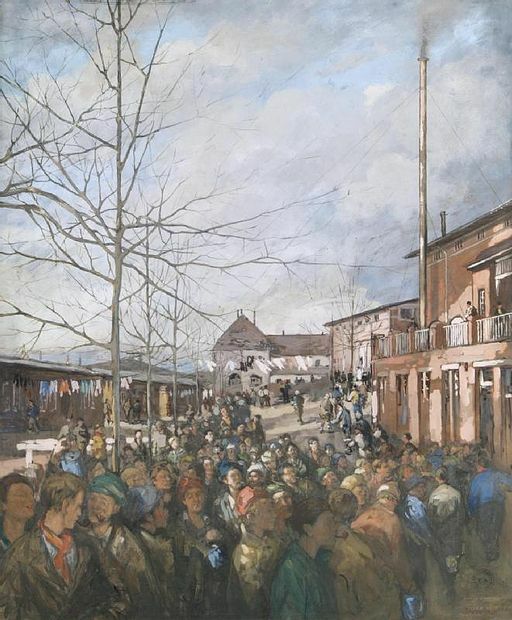 As far as British prisoners were concerned, the German authorities adhered to the principles of The Geneva Convention, treating prisoners of war and interned personnel in a reasonable and civilised manner. The story of Ruhleben, 6 miles to the west of Berlin, is perhaps typical of at least one camp for British prisoners of war. The camp was built on a former racecourse and became home to about 5,000 British nationals who had become trapped in Germany at the outbreak of the first world war. There were also the crews of ships captured at sea or stranded in German ports, together with those of fishing trawlers out of British ports, such as Hull and Grimsby. Prisoners were allowed to administer their own affairs. They even organised their own police force and a postal service, Ruhleben Express Delivery, which printed its own stamps and handled about 6,000 letters per month. There was even a casino and a number of private businesses. There was a music society, which in 1915 put on a production of The Mikado, and a pantomime at which the American ambassador to Germany, James W.Gerrard, was a guest. As there were some keen sportsmen among the prisoners, including footballers with international reputations, the Ruhleben Football Association was formed. However, the most original society formed by the prisoners was the Ruhleben Horticultural Society, involving 900 men who cultivated gardens outside and inside the confines of the camp. Within days of its first meeting the society had applied to London’s Horticultural Society to become an affiliated member. Members of the Society were amazed to receive this written request from the heart of a country with which they were at war, but attempted to help the prisoners all they could, sending seeds, bulbs and advice on cultivation. The Crown Prince of Sweden also provided seeds. Although vegetables (mainly cabbages, lettuce, celery, marrow and tomatoes) were grown to supplement camp diet, a whole variety of flowers and shrubs were also cultivated in order to add colour to the dull surroundings. Sweet peas seem to have been a favourite with the men. Perhaps it says something for conditions in the camp that only one man attempted (and succeeded) to escape. After the armistice, the camp was disbanded and its inmates sent home. A number wrote books and memoirs. Group photographs of the members of the RHS can be found in the archives, and they show the men in tolerable good health, albeit rather thin. An exhibition at the Garden Museum, Lambeth Place Road, London, SE1, is to be mounted to mark the centenary of the Great War, on October 5th, 2014. It will later go on tour, from 2015 – 2016.